﻿ Profile > Junaidi Khotib, S.Si., M.Kes., Ph.D, Apt. Junaidi Khotib, S.Si., M.Kes., Ph.D, Apt. 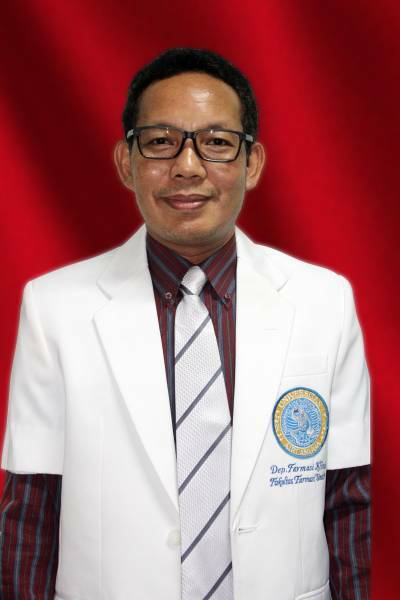 2001-present: Lecturer at Department of Clinical Pharmacy, Faculty of Pharmacy, Airlangga University, Surabaya, East Java, Indonesia. 2005-present: Visiting Lecture at Faculty of Pharmacy, International Islamic University Malaysia. 2007-present: Consultant of The National Agency of Drug and Food Control. (1). Khotib, J., Narita, M., Ozaki, S., Suzuki, T. Heterologous mu-receptor modification by repeated stimulation of kappa-receptor in the mouse brain. 33 rdInternational Narcotics Research Conference, California, July 9-14, 2002. (2). Shimamura, M., Narita, M., Yajima, Y., Khotib, J., Kubota, C., Suzuki, T. Up-regulation of PGE 2-receptor, but not PGI 2- and opioid-receptors, in the mouse spinal cord following peripheral inflammation. 33 rdInternational Narcotics Research Conference, California, July 9-14, 2002. (3). Khotib, J., Narita, M., Suzuki, M., Ozaki, S., Suzuki, T. Heterologous m-opioid receptor modification by repeated stimulation of k-opioid receptor: Up-regulation of G-protein activation and antinociception. The 23 rdJapan Narcotics Research Conference, Tokyo, August 23-24, 2002. (4). Shimamura, M., Narita, M., Yajima, Y., Khotib, J., Kubota, C., Suzuki, T. Role of spinal COX/PG pathway in the expression of chronic inflammatory pain. 123 rdThe Japanese Pharmaceutical Society Meeting, Nagasaki, March 27-29, 2003. (5). Khotib, J., Narita, M., Mizoguchi, H., Suzuki, M.,Yajima, Y., Tseng, L.F., Suzuki, T. The up-regulation of central mu-opioid receptors functions induced by repeated stimulation of kappa-opioid receptor. 34 thInternational Narcotics Research Conference, Perpignan, France, July 11-16, 2003. (6). Kuzumaki, N., Narita, M., Khotib, J., Kaneko. C., Miyagawa, K., Tanaka, S., Suzuki, T. Mechanism of anxiogenic effect in normal aging. 1 stInternational Neurobehavioral Pharmacology Meeting, Okayama, September 12-15, 2003. (7). Kuzumaki, N., Narita, M., Kaneko. C., Khotib, J., Tanaka, S., Suzuki, T. Mechanism of anxiogenic effect in normal aging. 109 thKanto Area Meeting of The Japanese Pharmacological Society, Tokyo, October 4, 2003. (8). Khotib, J., Narita, M., Suzuki, M.,Yajima, Suzuki, T. Direct evidence for the up-regulation of central mu-opioid receptor functions induced by repeated stimulation of kappa-opioid receptor. 33 thJapan Neuropsycopharmacology Meeting, Nara, October 8-10, 2003. (9). Khotib, J., Narita, M., Niikura, K., Yajima, Suzuki, T. Studies on drug dependence (Rept. 387): Short-term up-regulation of m-opioid receptor functions after repeated administration of the k-opioid receptor agonist in the thalamus of rodents. The 77 thAnnual Meeting of the Japanese Pharmacological Society, Osaka, Maret 8-10, 2004. (10). Khotib, J., Narita, M., Niikura, K., Yajima Y., Syamsiah, S., Suzuki, T. Short-termed up-regulation of mu-opioid receptor functions after repeated administration of the kappa-opioid receptor agonist in the rodent. 35 thInternational Narcotics Research Conference, Kyoto, Japan, July 18-23, 2004. (11). Khotib J., Narita M., Narita M., Suzuki M., Niikura K., Yajima Y., Syamsiah S and Suzuki. Studies on drug dependence (Rept. 405): Involvement of neuronal migrating regulator in the development of tolerance to morphine-induced antinciception. The 78 thAnnual Meeting of the Japanese Pharmacological Society, Yokohama, Maret 22-24, 2005. (12). Usui A., Narita M., Yajima Y., Narita M., Khotib J., Suzuki T. Studies on pain control system (Rept. 34): Involvement of spinal thrombin/platelet-derived growth factor (PDGF) pathway in the development of neuropathic pain-like state. The 78 thAnnual Meeting of the Japanese Pharmacological Society, Yokohama, Maret 22-24, 2005. (13). Rahmadi M., Khotib J., Suprapti B., Sjamsiah S. Antinociceptive effect of kappa-opioid receptor agonist in the acute and chronic-pain state. The 14 thAnnual Meeting of the Indonesia Pharmacy Association, Bali, June 17-19, 2005. (14). Khotib J. Molecular mechanisms of development opioid-induced antinociceptive tolerance. The 14 thAnnual Meeting of the Indonesia Pharmacy Association, Bali, June 17-19, 2005. (15). Khotib J., Zulkarnain BS., Yulistiani, Sjamsiah S., Suzuki T. Role of kappa opioid receptor agonist (-)U-50,488H on the attenuation of withdrawal symptoms in morphine or amphetamine induced-dependence. The 14 thAnnual Meeting of the Indonesia Pharmacy Association, Bali, June 17-19, 2005. (24). Khotib J, Inactivation of protein Tyrosine Phosphatase (PTP-ase) linked Insulin Receptor Mediated the Hypoglycemic Effect of Vanadyl Sulfate, The 8th Asian Conference on Clinical Pharmacy, Surabaya, 1-4 July 2008. (28). Khotib J, The Rationality of Antineoplastics Therapy, The 10th Asian Conference on Clinical Pharmacy, Singapura, 9-12 July 2010. (29). Khotib J, The Pharmacy Education in Indonesia, 11st Asian Conference on Clinical Pharmacy, Manila, 24-27 June 2011.